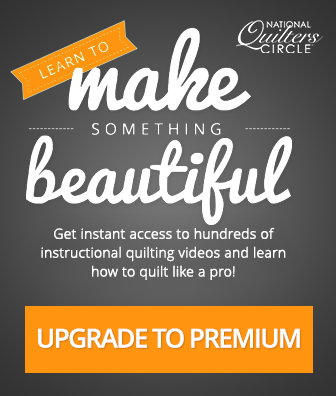 Select your membership plan and get our best quilting videos, projects and patterns with 24/7 access to tips and techniques from our quilting experts, automatic renewal and our ‘cancel anytime’ policy. A cathedral window quilt pattern is a fun way to add a small pop of color to a quilt by using a neutral background color and darker prints for the windows. Learn how to make a cathedral window quilt using a more traditional fold and sew method and pre-cut fabric squares- Ashley Hough shows you how. Before showing you how to make a cathedral window quilt, Ashley first goes over the fabric needed to make the design. This pattern utilizes a common pre-cut fabric known as a charm pack, which is a bundle of 5” squares of fabric. Using a pre-cut fabric bundle is a fun way to be able to combine anywhere from 20 to 40 different squares of fabric that are either from the same collection or are somehow coordinating colors and prints. With the pre-cut 5” squares of fabric you will also need a 16” square of neutral colored background fabric. Ashley then shows you how to begin folding and sewing the background square of fabric. The initial stitching on the background fabric is done in a way that hides the stitching on the inside of a small square that gets turned right side out. Once that stitching is done, Ashley shows how to again fold the background square in preparation for adding the window sections. For each window you plan to add to the cathedral window quilt you will need two background fabric rectangles as the windows appear where the background squares are stitched together. Ashley shows how to attach multiple background squares together after they have been folded and pressed. She then shows how to make a cathedral window quilt by adding the 5” square of fabric to the window and folding over the edges to finish it off. Once you learn the technique of how to make a cathedral window quilt you can either make a large quilt or something smaller like a cathedral window patchwork pillow. Also, if you have any pre-cut fabric squares left in your fabric bundle make a tote bag with charm packs for another fun accessory. Carolyn Beam shows you how to make your own designer blocks. You will learn how combine two blocks from two different four patch patterns to make your own designer block. 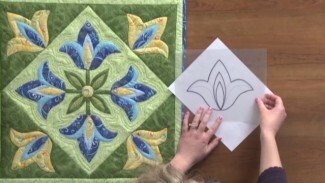 Then see how she uses her quilting software to see how the new designs look on an actual quilt.